Sold Out in 5 Minutes – The U.S. Mint’s FIRST-EVER American Eagle Palladium Proof! In 2017 when the U.S. Mint made palladium the fourth precious metal in its flock of American Eagle bullion coins, the first-year release literally flew out the doors! 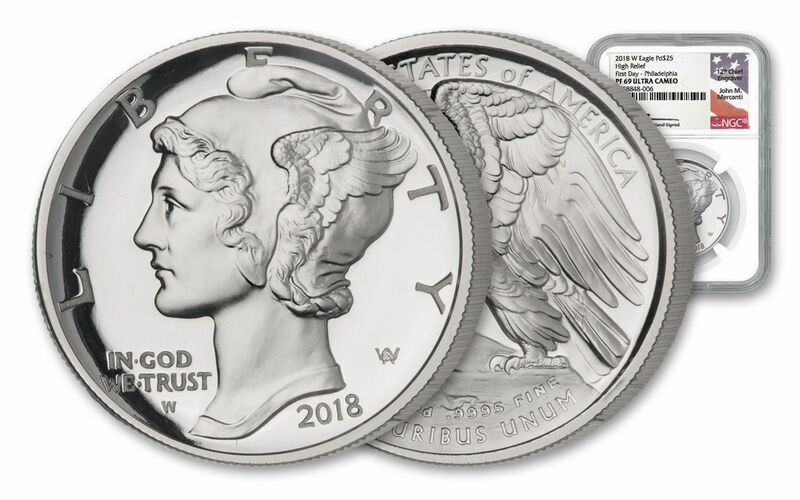 In 2018, The Mint took the palladium series a step further and released the FIRST-EVER American Eagle Palladium PROOFS struck especially for collectors in dazzling high relief! It was so popular that the entire 15,000 edition sold out within 5 minutes! Besides the exquisite beauty of palladium, these coins also feature treasured designs that are revered as time-honored masterpieces in the world of numismatics. This legal-tender, one-ounce coin features outstanding high relief versions of designs created more than a century ago by Adolph A. Weinman, a noted American sculptor who was also a student of the legendary Augustus Saint-Gaudens. The coin’s obverse features the iconic design from the “Mercury Dime” Winged Liberty. Struck from 1916-1945, the universally acclaimed Mercury Dime is today considered to be one of the most beautiful American coins ever struck by the U.S. Mint. The wings depicted on Miss Liberty’s head were supposed to represent freedom of thought, but for most people it looked like a depiction of the Roman god Mercury and the nickname stuck. The coin’s reverse features the design Weinman originally used for the 1907 American Institute of Architects (AIA) Gold Medal – a majestic American Eagle perched on a stone outcropping holding an olive branch. The AIA Gold Medal is the highest honor awarded by the AIA each year and was presented for the first time in 1907 with Weinman’s design. The U.S. Mint’s Palladium Eagle series is the first time this design has appeared on a United States coin! At 34 mm in diameter, the $25 American Eagle One-Ounce Palladium Proof is larger than a U.S. Half-Dollar and nearly twice the size of the Mercury Dimes that circulated during the Roaring Twenties, Great Depression, and World War II. Combined with the high relief detail, the larger size vividly showcases these brilliant designs in a way that certainly does them justice. In fact, to make this coin possible, the U.S. Mint worked with the AIA to use the original plaster of the AIA Gold Medal to create the dies for the Palladium Eagle series. 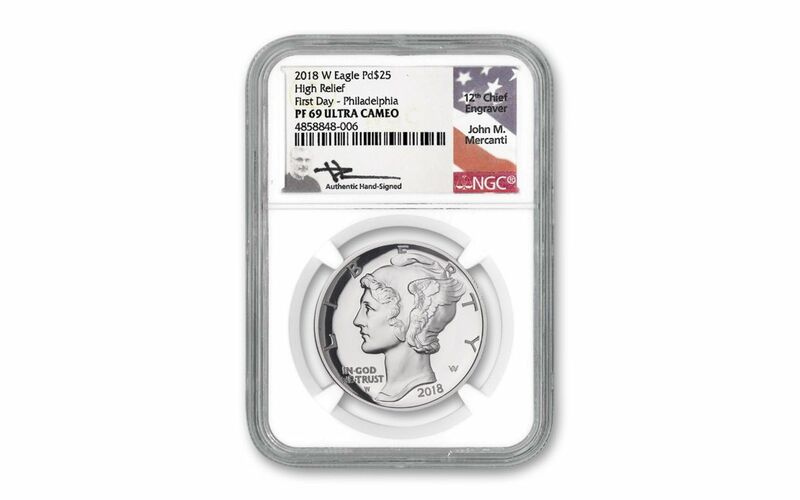 Your 2018 American Eagle One-Ounce Palladium Proof was struck at the West Point Mint in a full ounce of 99.95% pure palladium and will come graded by the Numismatic Guaranty Corporation (NGC) as being in near-perfect Proof-69 Ultra Cameo (PF69UC) condition, a distinction that means your almost-flawless coin will showcase an impressive full strike and indistinguishable imperfections – well above and beyond the quality of the vast majority of coins in the series. In addition, NGC has graded your Palladium Eagle to be a First Day of Issue (FDI) coin, meaning it was received by NGC or an NGC-approved depository by the release date or on the business day within 24 hours of the official release date. Plus, each Palladium American Eagle Proof in this offer comes sonically sealed in an acrylic holder with a Philadelphia release location designation label that was personally signed by John Mercanti, the U.S. Mint’s 12th Chief Engraver! Don’t wait to secure your 2018 American Eagle One-Ounce Palladium Proof. The U.S. Mint struck just 15,000 Palladium American Eagle Proofs. Of that mintage, only 150 have been certified by NGC as First Day of Issue coins. With an edition that is completely sold out at the Mint, these first-ever proofs already have anxious collectors around the world eagerly queuing up to own one. Order yours now! FIRST-EVER AMERICAN EAGLE PALLADIUM PROOF – This is the U.S. Mint’s FIRST-EVER American Eagle Palladium Proof. It comes on the heels of 2017’s first-ever American Eagle Palladium bullion coin that was an immediate and successful hit with collectors. COMPLETE SELL-OUT AT THE U.S. MINT – When the U.S. Mint released this series for sale on September 6, 2018, the entire 15,000 edition sold out in just 5 minutes! 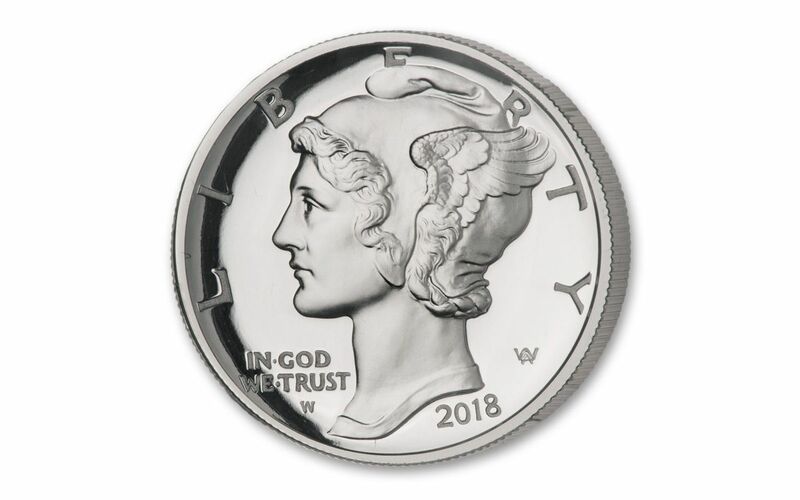 ONE OF AMERICA’S MOST POPULAR COIN DESIGNS – The 2018 American Eagle One-Ounce Palladium Proof features the same design used on America’s “Mercury Dime” struck form 1916-1945. The beloved image was designed by German-born American sculptor Adolph Weinman and was named for the image of a Winged Liberty Head that looks like the Roman god Mercury. The coin’s reverse features Weinman’s design that was used for the 1907 American Institute of Architects (AIA) Gold Medal. STRUCK IN HIGHLY-PURE PALLADIUM – These American Eagle Palladium Proofs were struck in a full ounce of 99.95% palladium. One of the world’s rarest metals, palladium is a silver-colored precious metal that is highly resistant to corrosion and oxidation. LEGAL-TENDER U.S. 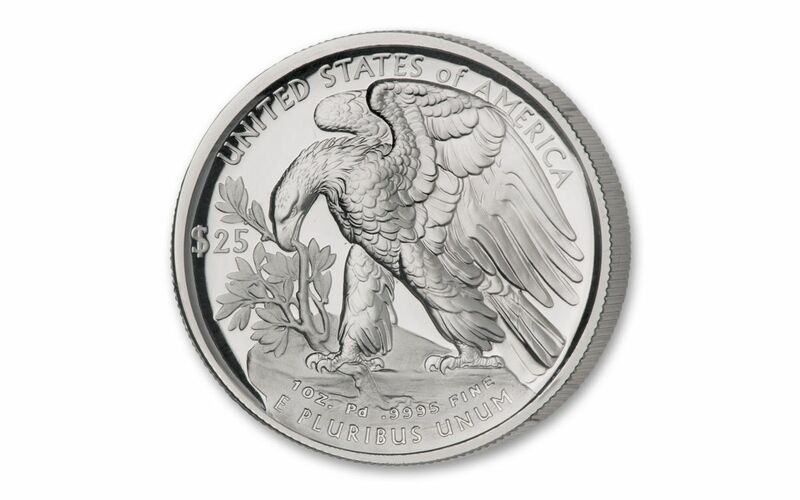 COINS – Each American Eagle Palladium Proof is $25 legal tender. GRADED IN NEAR-PERFECT PROOF CONDITION – Your 2018 American Eagle One-Ounce Palladium Proof has been graded by the Numismatic Guaranty Corporation (NGC) as being in near-perfect Proof-69 Ultra Cameo (PF69UC) condition. KEY FIRST DAY OF ISSUE CERTIFICATION – NGC has graded your 2018 Palladium Eagle Proof to be a First Day of Issue (FDI) coin. PERSONALLY SIGNED BY JOHN MERCANTI – Each Palladium American Eagle Proof comes sonically sealed in an acrylic holder with a Philadelphia release location designation label that was personally signed by John Mercanti, the U.S. Mint’s 12th Chief Engraver! LOW LIMITED EDITION – The U.S. Mint struck just 15,000 Palladium American Eagle Proofs. Of that mintage, only 150 have been certified by NGC as First Day of Issue coins! The first-ever American Eagle One-Ounce Palladium Proof is sure to be a hit with collectors so click one to your cart now while you still can!